I had planned to get another Hawaii post done today. But the craziness that is moving has kicked in this week. Calling health insurance brokers, filling out paperwork, posting stuff on Craigslist (and filtering emails from crazy people – ahhhh! ), sorting through the dumbest piles of things (old magazines that I MUST have kept all this time for a reason. So having to look through every page before throwing away). AND on top of that there’s Valentine’s Day and our little girl is turning five next week. So. 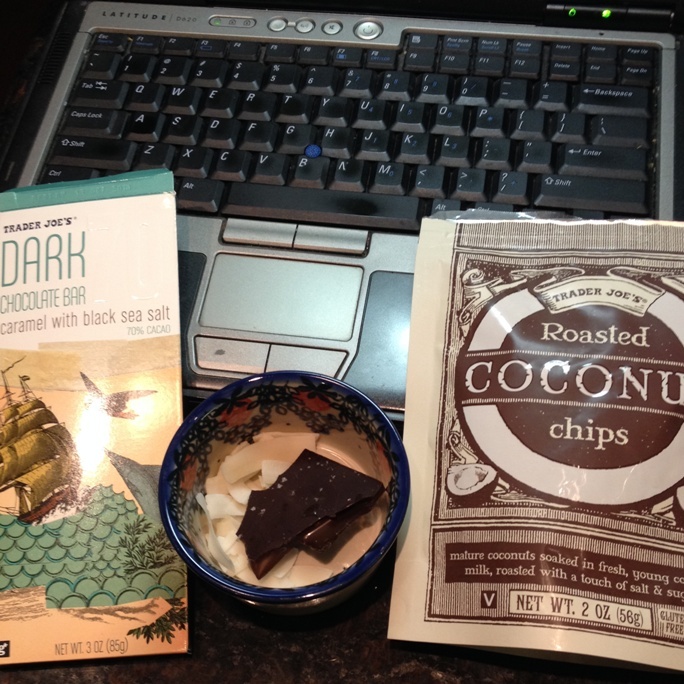 Instead of Hawaii, I give you one of my favorite blogging snacks: Trader Joe’s Caramel w/ Black Sea Salt chocolate bar with a few pinches of Roasted Coconut Chips. Paired with a full-bodied red wine (my fave: Cabernet Sauvignon), it’s pretty perfect combo. Having some right now (except with Cotes du Rhone instead of Cab). Come to think of it, I often (always?) snack when I blog. What’s your favorite blogging snack? This entry was posted in Food and tagged Blog, Blogging, Cabernet, Coconut, Dessert, Food, Salted Caramel, Sea Salt, Snack, Sweet Tooth, Trader Joe's, Wine. Bookmark the permalink. I was just talking about one of the things I miss most out here is Trader Joe’s. Can’t go wrong with some TJ’s. For sure. Thank heavens there is a Trader Joe’s in Grosse Pointe that opened several years ago. Whenever my mom is in town (SF), she stocks up on TJ’s favorites. I feel your pain! Moving from the Flint area to Las Vegas was a major pain. I usually snack on diet Coke or cereal when in front of the pooter.